..this is what I need to do. A few of my neighbors have created some unbelievable systems and have big plans. Plans beyond just watering roses- but actually connecting them to their bathroom toliets for ‘flush’ water…. I admire you guys. Right now, I just need to water my tomatoes before I have another failed crop. I’m excited, maybe there is hope for my garden this year. Want to tour some cool homes? Then buy your tickets for the Historic West End Tour of Homes at www.AtlantaWestEnd.com the home tour will be May 2&3! Come out and see lofty 1920 Bungalows, Brick Craftsman’s, homes with renovation in progress and homes to covet- you don’t want to miss this. Tour our gardens, a highly anticipated urban farm (buy fresh produce on your stroll!) as well as historic Brown Middle Schools! In addition to the gracious families extending an open invitation to tour their homes, there will be open houses on a few that are for sale!! Don’t forget about our Wrens Nest concert Friday night, (May 1st)! Read all about it on the West End website..
Saturday’s clean up/ BDCA Recruitment was a success! The weather remained cool and the clouds held back the rain. Our resident councilmembers came out to show more than support- Ceasar Mitchell and Cleta Winslow. My daughter had a wonderful time working within the community and on the farm. Lydia is 7 and also had an opportunity to work with the video camera. She assisted with interviewing the volunteers; I’ll try to get a copy of the footage. I encourage the residents within our communities with children to get them involved. 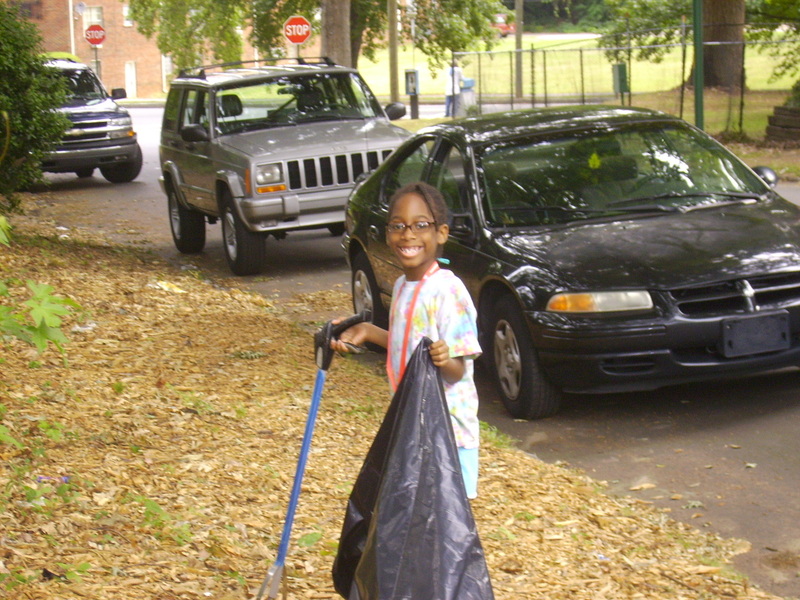 Bring your kids to the meetings, clean-up’s and any community event. We work for their future and the best way to raise active, concerned kids is to start by making them aware of the current concerns and how YOU are helping to make a difference. Believe me, I understand how hard it is to have kids come along, sit still and be quiet at meetings- but everyone of our community organizations with NPU-T are child friendly and filled with loving patient people who UNDERSTAND!